The Chihuahua’s are back! My kiddos have loved the first two Beverly Hills Chihuahua movies and now that the third one is out they are beyond excited! Everyone’s favorite talking Chihuahuas Papi (voice of George Lopez) and Chloe (voice of Odette Annable) are back, joined by their five playful pups in an all-new family comedy. It’s canine chaos as Papi’s family (dog and human) move into the posh Langham Hotel, complete with a luxurious doggy spa. But there’s trouble in puppy paradise when Rosa, the littlest member of the pack, feels smaller and less special than ever. Now it’s up to Papi to help Rosa find – and celebrate – her inner strength, which turns out to be bigger than she ever dreamed and reminds humans and canines alike of the importance of family, friends and teamwork. Papi and Chloe’s pack of five pups include the voices of Kay Panabaker (“Little Birds”) as Rosa, Emily Osment (TV’s “Hannah Montana”) as Pep, Madison Pettis (Disney Junior’s “Jake and the Never Land Pirates,” “Game Plan”) as Lala, Logan Grove (TV’s “Young Justice”) as Papi, Jr., and Delany Jones as Ali. The canine cast features the voice talents of2Miguel Ferrer (“Beverly Hills Chihuahua,” “Traffic”) as Delgado, Eddie “Piolin” Sotelo (“Beverly Hills Chihuahua,” Hispanic National Radio Morning Show DJ) as Humberto and Tom Kenny (“SpongeBob Square Pants”) as Sebastian. The film’s human stars include Marcus Coloma (TV’s “Make It or Break It,” South Beach”) and Erin Cahill (“Fast Track: No Limits”, “Boogeyman 3”) who reprise their roles from “Beverly Hills Chihuahua 2” as the dog’s masters, Sam and Rachel Cortez, plus Frances Fisher (“The Lincoln Lawyer” and TV’s “Torchwood”) as travel writer Amelia James. Fans who fell in love with Papi and Chloe in the box office hit “Beverly Hills Chihuahua,” and their universally beloved litter of pups in “Beverly Hills Chihuahua 2” (the #1 direct-to-video title of 2011*), will enjoy this exciting and playful new installment in the pedigreed franchise. 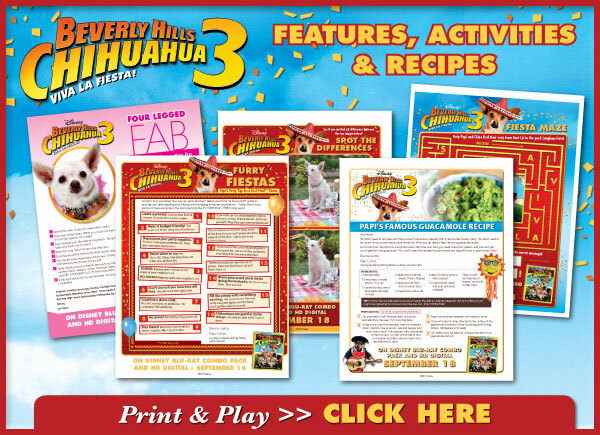 The all-new “Beverly Hills Chihuahua 3: Viva La Fiesta!” is a must-own family fiesta of fun for everyone. Based on characters created by Jeff Bushell, the film is written by Dana Starfield. It is directed by Lev L. Spiro and produced by Sara E. White. The movie is so adorable and definitely lives up to the franchise. My kiddos are definitely into the “talking animal” movie genre right now and I have a feeling all three movies will be in the rotation for a while. In celebration of the release of the film you can download some amazing activities and recipes for you and the kiddos! Have you seen the Beverly Hills Chihuahua movies? Are you planning on getting the 3rd movie for your kiddos? Previous Lisa of Three at Once! Next Are Your Multiples in Different Classes?